File I/O is an important topic when it comes to RPG Maker. Everything that you work with is stored in external files and are loaded by the engine at run-time, whether they are database files, graphics, audio, or your own custom text files. Regardless of your experience with Ruby, there are a couple things in RM that you should know about when you’re working with files. Which is a pretty normal way to open a file and read the contents of the file. So let’s say you had a CSV file that you use for storing tabular data called “custom_data.csv” stored in the project’s Data folder. And then you test it in your project, and it works fine: you’ll see the contents of your file in your console as a string. Couldn’t find the file? As an experienced debugger, you ask some preliminary questions in case this was simply a case of user error. Did you change the script to read a different file? It’s possible. Does it work in a new project? Maybe it’s a script compatibility issue! They will tell you they did everything correctly. You check your dev project again to make sure everything works. And it does. File’s in the right place, works in a new project. What happened here? You followed the tutorials that you found online on Stackoverflow or RubyMonk or anywhere else that may be credible. You clearly had a working script, but after encrypting the files RM can’t find it anymore. 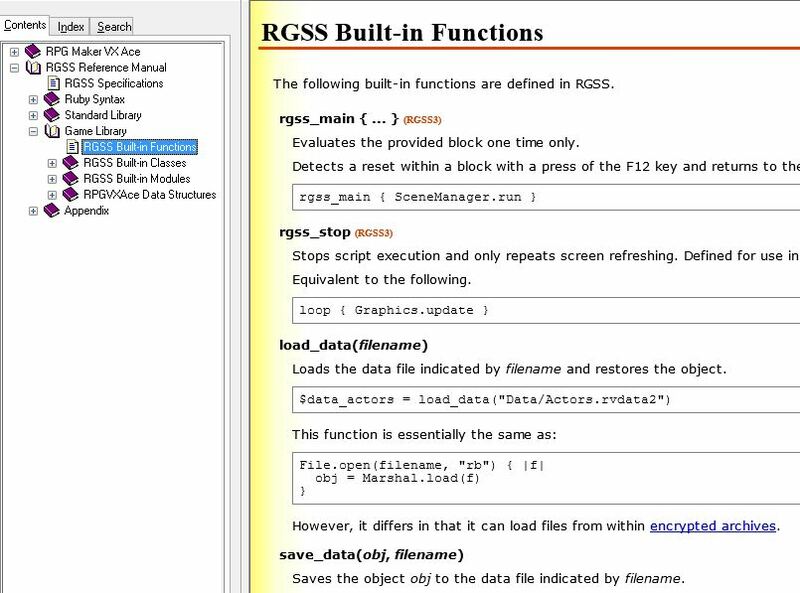 There’s one difference between the way files are stored in a encrypted project, and an unencrypted project, and that is the RGSS3A archive. Basically, File doesn’t know how to find files in your encrypted archive. And neither does Dir for that matter so if you’re using that you might need to re-think your strategy. Pretty straightforward. It looks instead of calling `File.open` all we have to do is call `load_data` and pass in our path. But now there’s another subtle issue: what the `load_data` function does is to call `Marshal.load`. If you’re working with one of the RM data files (the ones ending in rxdata, rvdata, or rvdata2), that would work. But if you have for example a plain-text CSV file, that’s not a Marshal serialized file, and so Marshal will fail while trying to load it. 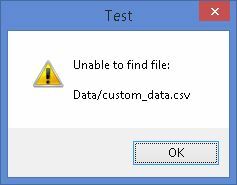 If you’re not convinced, you can try loading your CSV file. You won’t get a “file not found” error, but you’ll get a different error. In this case, we introduce a little script that changes the way Marshal loads files. It first tries to load the file as usual, but if it fails, it then just reads the file as a raw byte string and returns that to you. I didn’t come up with the technique. I don’t remember who posted it though. So when I said you can just “process it like usual” it’s not completely true. The strange characters you see in the beginning is the byte-order mark for your document. If you saved it as UTF8, this is what you will likely see. One big difference you will run into is that all of the data is read in binary mode, and not text mode. 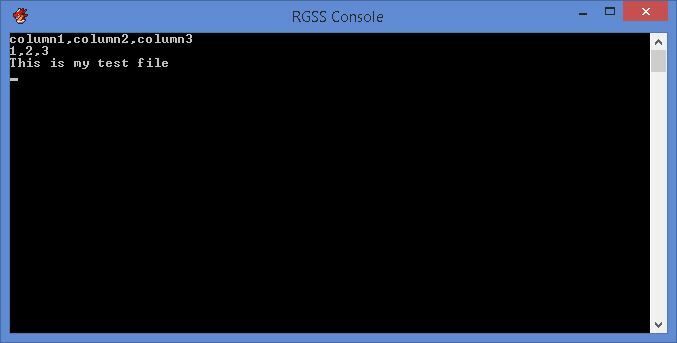 This means that you will see all of the raw bytes as they are stored in your file (new-lines, carriage returns, byte-order marks, etc). You will need to process these yourself somehow, and that’s a lot of extra work. If you need UTF8 documents, consider saving them in “UTF8 without BOM”. Some text editors support this (notepad++ for example). This will get rid of those three bytes in the beginning. Next, your data is read as a single string. You can split on end-of-line characters such as \r\n, and then iterate over each line. Now you should be able to process it like usual. Reading a file in RM is pretty much the same as reading a file in any other Ruby-based application. However, the one thing that you need to keep in mind is that the extra layer of encryption requires you to use functions provided by RM to properly access those files, and that you will need to test that your scripts work in encrypted projects. However, with the technique that I’ve outlined in this tutorial, you should be able to work with custom files without having to worry about whether the user’s project will be encrypted or not.